I’m noticing a theme here in these 1992 Cubicle Counts. I guess my attitude toward the job nosedived a bit. I don’t remember when I transferred out of the department, but I hope for Cartoon Jon’s sake it’s soon! Really a pretty cliché-y strip when you come right down to it, but–well–I’m sure it felt good to vent. “Editing & Indexing” it still is, I see. The lines look blacker and stronger here, and there are NO sketch lines. This might have been drawn when I was experimenting with actual ink pens instead of fine-line markers (Pigma Micron 0.03). I’m liking the cleaner look. For the record, I never actually ripped up journals, spray painted walls, or smacked my boss. Poor Paul. He was actually a good guy who deserved better than to have had the likes of me in his group. According to the Google, he’s running his own photography business these days. That’s a good thing. I think photography was always his passion (being a BIOSIS group leader was a close second, I’m sure.). 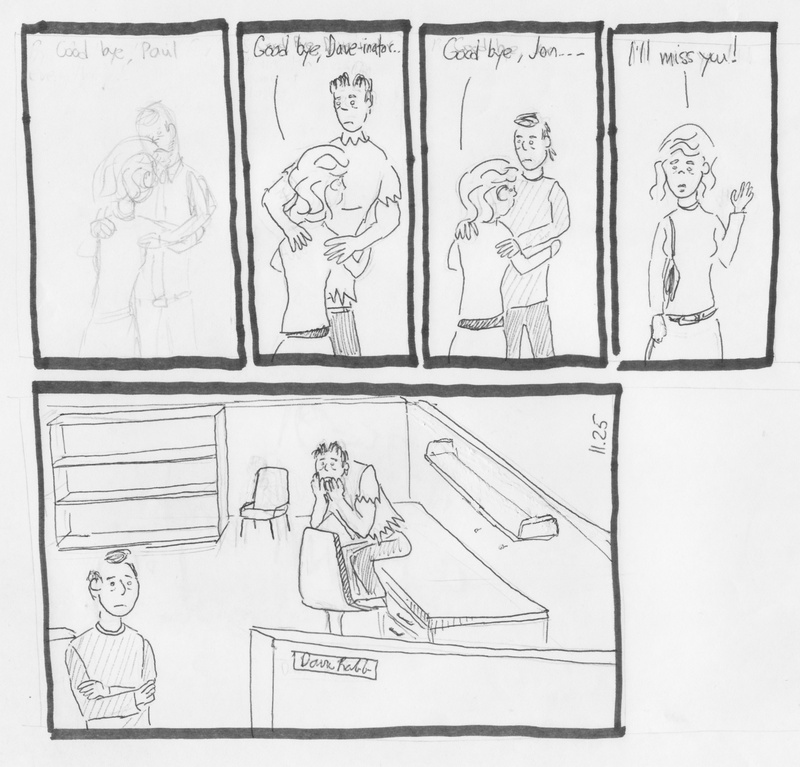 I just noticed as I started this entry that the comic featured here was drawn several months after the previous ones. I have no idea what would have caused the hiatus: I seem to have been going at an every-couple-of-weeks clip prior to this break. To any HR personnel stumbling on this site while doing a background check prior to making me a lucrative offer: ha, ha! This isn’t reflective of my work ethi–oh, who am I kidding. 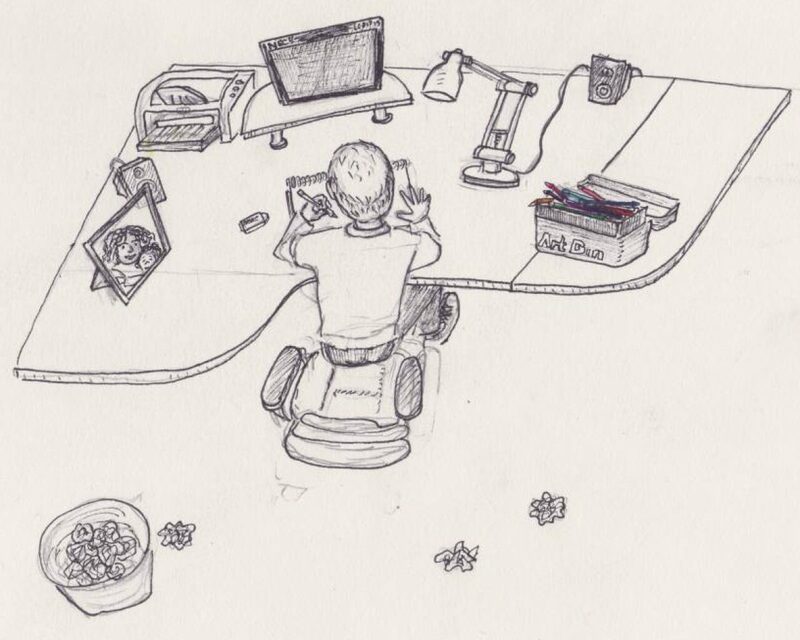 Cartoon Jon here didn’t have any pressing deadlines and worked 15 hours the day before. Probably. I’m noticing an increasing trend toward background-less panels, which I’m not sure I like. I wish I’d thrown in a cubicle wall or a bookshelf in panel 3. On the other hand, the sinking-ship/Batman-villain tilted-camera perspective in panel 1 looks a little weird. 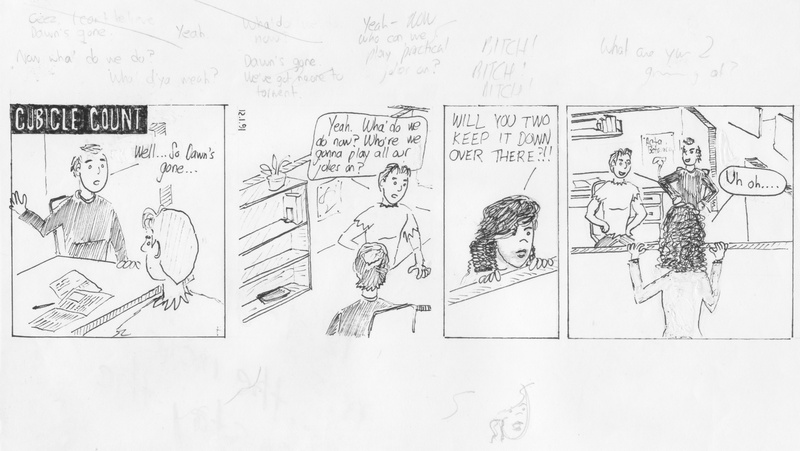 Finally, The talk bubble-less dialogue suggests to me that I was experimenting with different cartooning styles. Being a fervent disciple of Charles Schulz, I always incline toward closed talk/thought bubbles. Addendum: It just occurred to me how ridiculous, in the light of having been in the workforce for almost 30 years, the idea of assigned break times are. But BIOSIS had ’em! 10:15 and…2:30 (I think). I don’t remember if lunch was also scheduled for a particular time. Also don’t remember whether group leaders had to hold our hand and walk us to the potty. I didn’t waste any time taking the air out of this story line. It’s just as well: it was all pretty ridiculous. Not sure if the lack of backgrounds was intentional or laziness, though cubicle walls hardly make for interesting scenery. Looks like I was wrong in my earlier posts–looks like the department is still called “Editing and Indexing.” So dynamic! I’ve been adding tags to these posts to see if I can push these comics into the search results for “BIOSIS.” Not that I think that’s a popular search, mind you. So Joe went and got hisself some knee surgery, putting him in a gigantic leg brace for several weeks. In a place like the BIOSIS fourth floor, a development like this was big excitement (bear in mind, seeing a dog out the window was also big excitement–have I mentioned that this job was a little dull?). Anyway, this must have seemed like a good way to keep the Dave-inator story idea going. I’m digging the vibration effect in panels 2 and 3. I DON’T like the weird, slouchy posture of Tracey in panel 1. No need to audition for a replacement for Dawn with Tracey on hand. This rendition of Tracey looks a lot more like the real Tracey, though I think I should have added a freckle or two. If these comics are to be believed, Dave and I spent a lot of time sitting around in my cubicle. Which sounds about right. Why, yes that is an Acta Botanica poster in my cubicle. I wonder what the hell Acta Botanica was (I think it was a foreign botany journal. I must have used my seniority to pull rank and claim that sweet…foreign botany journal…poster). I wish I hadn’t gone to the trouble of using a ruler to make the panel borders straight. The crappy freehand borders suit the strip better. Judging from the notes above the comic, I had rather the hard time coming up with the dialogue for this one. Clearly it was worth the effort. The result is so…Shakespearean! Always hard to lose a main character. 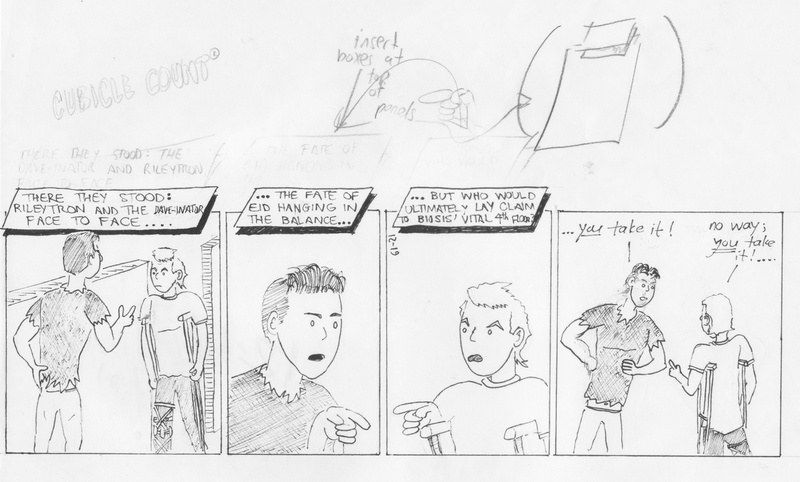 Poor Paul didn’t make the final cut, probably because of my preference for four-panel strips. Well, nothing major lost by leaving that first panel out. This one just tugs at the heart strings, doesn’t it?